Mr. Stanley has written a 2018 update to this essay. This is what the culture of dopage in cycling, and in sport, has done to me. By now, you know that Vincenzo Nibali was kicked out of the 2015 Vuelta a España after August 24’s Stage 2 for an exaggerated sticky bottle. If, like me, you saw only the 30 second clip [Click here for the clip], it was a sad moment for the sport. What you saw was Nibali as he led a chase group at speed, following a crash, as a team car caught up with him. You saw Nibali latch on as the car slowed and everyone in the group had to hit the brakes. Everyone slowed but Nibali, as the car accelerated to what appeared to be twice the speed of the group and the now 210 horsepower Nibali opened up a 400 meters gap in just a few seconds. It was more than a sticky bottle. A sticky bottle might last two or three seconds, and you will get a finger wagged at you by the commissaires. A few seconds longer and you’ll be fined, with perhaps a small time penalty. But this was blatant cheating. Nibali was towed by his team car. Everyone involved must have known that to cheat this boldly, in such a prestigious race, was certain to incur at least a massive time penalty, and at worst a disqualification. Why would a Grand Tour winner take that risk? And instantly, thanks to the culture of doping, my mind flashed back to the Seoul Olympics. You might remember the 1988 Seoul Games as the Games which exposed the depths to which Dr. George “Jamie” Astaphan and the Canadian track sprinter Ben Johnson were willing to plunge in search of the 100 meter gold medal. What might not be remembered is the story of Jürgen Hingsen. The West German Hingsen and the Brit Daley Thompson were the two finest decathletes of that era. Rumors flew through the Olympic Village during the 1988 Games that there were new and more sensitive dope tests in place. More than a handful of athletes withdrew, citing a variety of bogus reasons. More than a handful tested positive. Hingsen, during the 100 meters of the decathlon, false started in his heat. His second false start came moments later. He had barely settled into the blocks, the starter called “set” and Hingsen strolled out of the blocks like a man looking for a Starbucks. Disqualified. A ‘graceful’ exit. Hingsen was a certain bet for a medal, and the accompanying dope test. It was thought by many on the scene at the time that Hingsen was worried, with good reason, about the dope test and needed to exit, stage left. No medal, true, but no positive dope test, and no public humiliation. To Nibali. While Nibali has a clean record, he races for what we historically know to be one of the dirtiest teams in cycling. My mind instantly went to the worst case scenario. I’m not accusing Nibali of doping. There’s no evidence. Yet, this is the place where the culture of doping and sport led me. We know that during the big era of EPO, many teams traveled with techs and mobile labs to ‘protect’ their investment i.e., the athletes. Imagine that Nibali has been microdosing with EPO. You keep your hematocrit at 49 and everyone is happy. For whatever reason, Nibali’s hematocrit is at 52. Panic ensues at Astana. Word sneaks out, or is bought via bribe, that Astana will be visited by WADA. A team led by a convicted cheat and doper in Vinokourov now has a big problem. What to do? You cheat. You know full well that expulsion from the race will result if a scrutinized star like Nibali is caught being physically towed by a team vehicle. ¿Qué es peor? Doping? Or taking a tow? No question, take the tow and head right out of the race. I hate that this, moments after I saw the clip, is where my mind went. 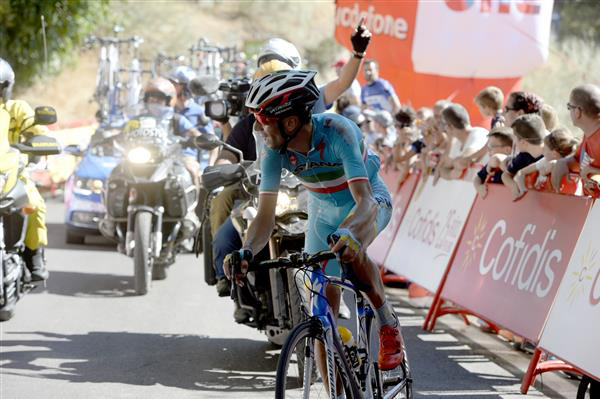 I admire Nibali as a rider. He rode with such grinta in his 2014 Tour de France win. He rode bravely after a poor start to this year’s Tour de France. I’ve never, for a moment, thought he was a doper. Yet, here I am. I hate this.